Why choose Driving Test Success? Multiple platforms available for the way you want to learn: PC, Mac, DVD players and games consoles, digital downloads, online training and Apps. NEW Practise using ALL the official DSA revision questions, valid from September 2011 onwards. Suitable for learner car drivers, motorcyclists and ADIs in Great Britain and Northern Ireland. Practise case study questions covering all 14 DSA categories. NEW View official DSA explanations. Customise tests to practise questions that need more revision. 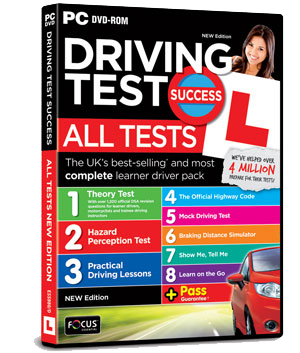 Printable Theory Test book and exam papers. Learn on the Go - Practise official DSA Theory Test revision questions using your mobile, music player or tablet. Practise hundreds of interactive test simulation video clips. Sit unlimited random mock tests that accurately simulate the OFFICIAL test by the DSA. Watch the 10 OFFICIAL DSA Hazard Perception sample video clips and introduction video. Review each clip and find out where each hazard develops. Contains all the changes to the OFFICIAL DSA driving test including Independent Driving and Observer on Test. Contains all the OFFICIAL DSA Show Me, Tell Me test questions, plus step-by-step video tutorials....and much more.